A special thank you to Random House UK for sending me this book to review. Polly Price didn't think it was possible for her actress mother, Arabella Diamonte, to be any more embarrassing than on the trip to San Francisco last summer. That is until she agrees to take part in a television program called Celebrity Home Watch and a camera crew arrives at their home to film. 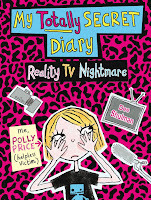 Her mother lacks volume control at the best of times, so this is truly a reality tv nightmare - with no escape for Polly! What a darling book! The illustrations alone are worth a look at this book. I had a little giggle on each page with the pictures. Very cute! It is written just like a journal. Full of marked out mistakes, and taped in keepsakes. This promises to be a fun read for any tween. I enjoyed it immensely! Go check it out! This book sounds cute. Nice review! Sounds so cute, I can't wait for Liz to read it someday. This does sound quite cute!